If you think you have seen the new garden bumblebee, please submit your record, uploading a picture to support your record. You will need to be registered and logged-on to do this, since the picture upload needs to be restricted to registered users. Even if you only have one record to submit, please do this and help record the spread and status of the bumblebee. 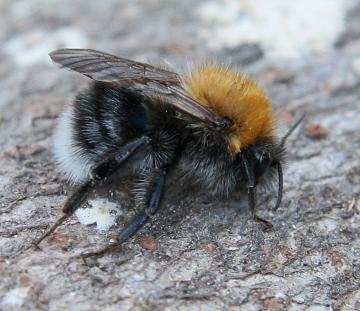 Bombus hypnorum, the new garden bumblebee or tree bumblebee, is a species of bumblebee which has recently colonised Britain and has already spread widely in southern England. Its distribution ranges over most of Europe and parts of Eastern Asia. It was first recorded in Britain on the northern fringe of the New Forest in 2001 (Goulson & Williams, 2001) but there have subsequently been numerous reports from the southern counties and London. It was first recorded in Essex during 2007 at Thundersley in the south of the county and at High Woods Country Park, Colchester in North Essex (Benton & Dobson, 2007). Most recently it has been recorded in 2009 from Little Baddow and the current distribution in Essex can be viewed here. The bumblebee can be recognised by its orange thorax (top uniformly ginger, yellowish-brown or buff) without a black band, and white tail. It could be confused with some individuals of the Common Carder Bee Bombus pascuorum with a lot of black hairs on the abdomen and a pale tail. Benton, T. & Dobson, J. (2007) Bumblebee report for 2006-7. Essex Naturalist (New series) 24: 66-69. Goulson, D. & Williams, P. (2001) Bombus hypnorum (Hymenoptera: Apidae), a new British bumblebee? Br. J. Ent. Nat. Hist. 14 (3):129-131.